While we’re on the subject of videos, take a look at Jesse Streeter’s latest wall-scraping video from Meihan Sports Land. Jesse is a fellow Australian and friend of mine who lives in Osaka, and you probably would have seen him on the previous video with Vaughn if somebody had remembered to call him (sorry Jesse!). The video was shot and edited by Laurence Janus (otherwise known as Mr L) without a single bit of pointless slow-motion! Jesse Streeter at Meihan Sportsland 8th April 2009 from L on Vimeo. 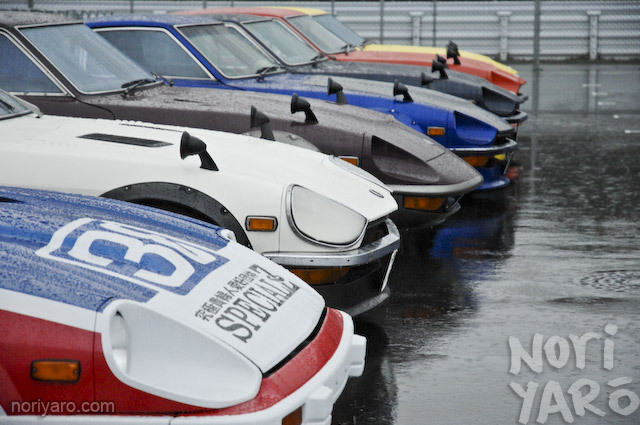 You may recall that a couple of weeks ago, I posted this panorama shot of a Z meeting at Fuji Speedway. It was at the “Time Machine Festival”, a two day event that featured decades worth of fast cars from all over the world, which ranged from daily drivers to proper race machines. The weather was pretty nasty all day, but it was still worth walking around in the driving rain to see what had come out to play. 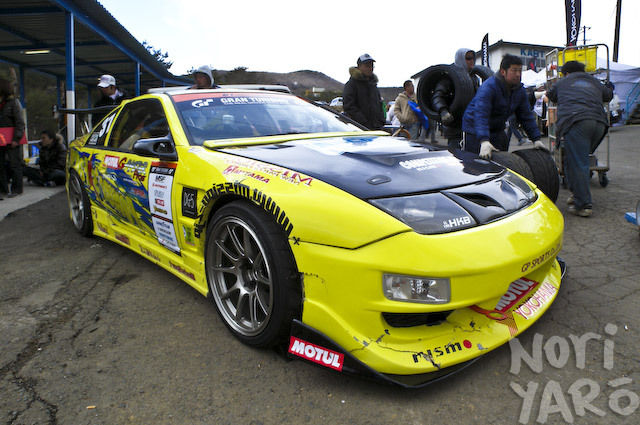 If it wasn’t already obvious, Fairladys were out there in force, so this post is dedicated to Nissan’s Z car. 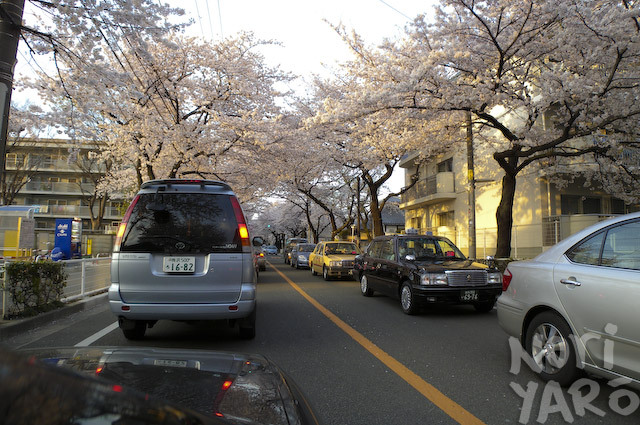 Quite often, you can spend almost an hour trying to drive a couple of kilometers in surburban Japan. For the past few days though, views like this have made what is normally a teeth-grinding chore into a pleasant cruise. 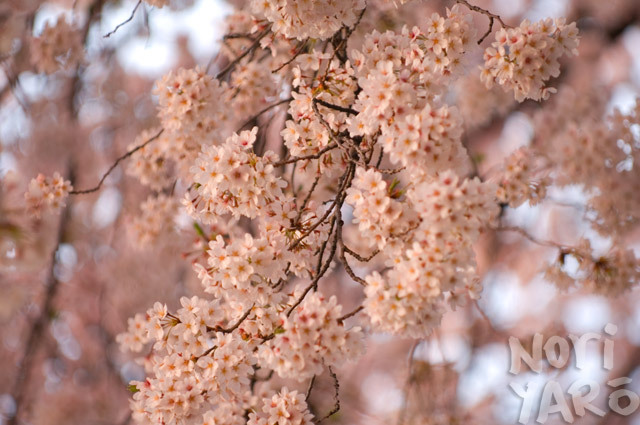 It’s cherry blossom season in Tokyo. Apparently, this is a good enough pretense to sit under the trees and drink alcohol. 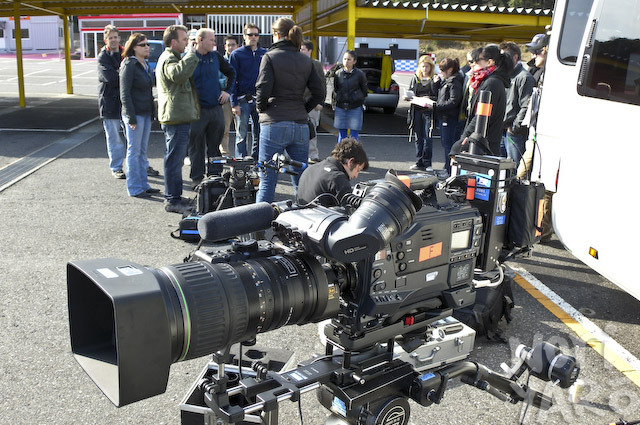 A couple of weeks ago, Shino had mentioned that she had been asked to come along to Mobara Circuit with her car, because an American film crew were coming, and wanted to film her drifting. Turns out it was for the second season of I Survived a Japanese Game Show! For anyone not familiar with the show (link to Youtube segments here) it’s an American reality show along the lines of The Apprentice or Survivor, based around competing in team-based, Japanese-TV-style challenges. The team that wins each challenge gets to do something cultural and fun, like visiting the Tokyo fish markets. The losing team has to do something difficult, yet still cultural, like working as rickshaw drivers or labouring in a rice field. This week’s winners won a ride in a drift car. 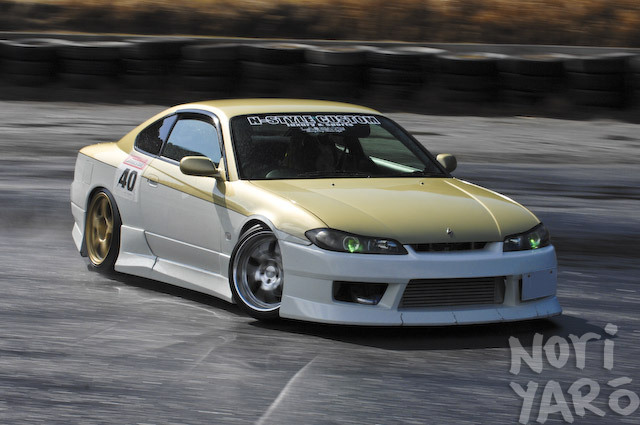 This car belongs to an unassuming bloke by the name of Tadashi Yanagawa. The interesting thing about him is that he can drift as fast in totally wet conditions as he can in the dry. 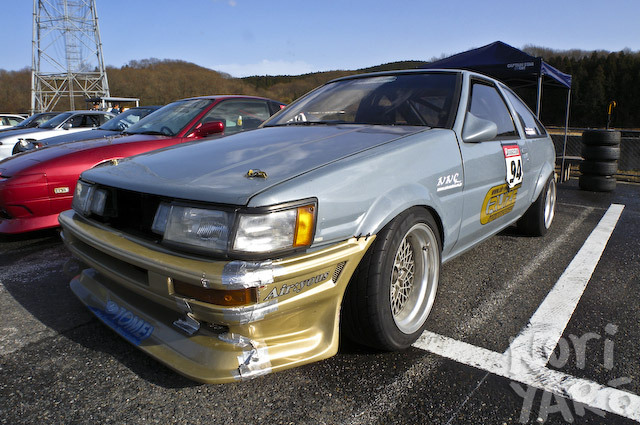 I saw him at a recent track day at Nikko Circuit and had to have a look at his car. Surprisingly, there’s not much more to it than many other AE86s out there, but it’s still pretty damn cool. 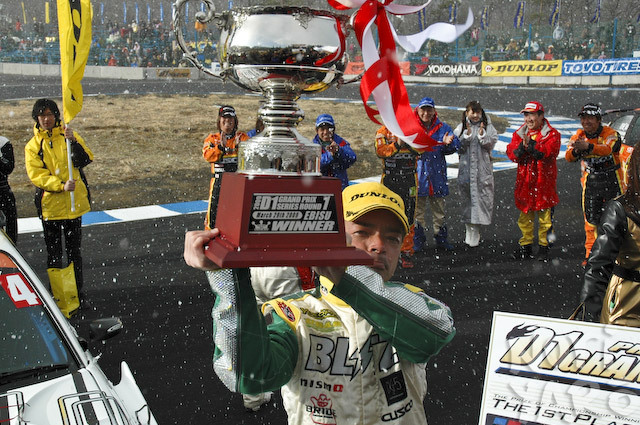 Congratulations Nomuken, winner of the 2009 D1GP Round 1 at Ebisu Circuit. I really should crouch down when taking a photo of him though. …and yes, that’s snow falling.